At MEDshop.dk you will find a large selection of display boards for different distances - depending on the size of the room where the board is to be used. 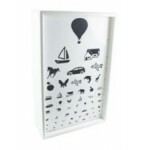 You will also find different light boxes for display boards as well as viewing boxes for eg. X-ray pictures. We also have cover plates for the eye, etc. The light boxes can easily be mounted on the wall. We have synopses for both children and adults. Including signposts with numbers, letters and E figures, etc. The syntax is either expressed as a fraction or a decimal. E.g:A signboard with a 6 m line is used. 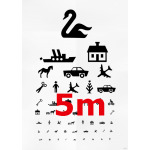 The person can recognize the characters on the 6m line from a distance of 6m - the person thus has a 6/6 sight or 1.0 in visual strength. 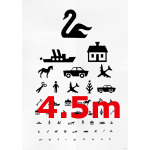 If the person could only see the 12m line, he had a 6/12 sight or 0.5 in the visual strength.